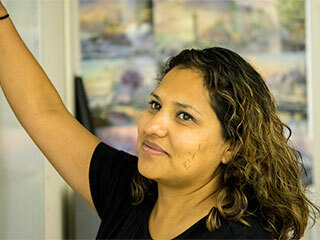 Jeanette Ponce enjoys teaching science and learning science. Photo by Hannah Stone. A series of new faculty members this year at Foothill High School. Jeanette Ponce teaches math and science at Foothill High School, but her favorite subject is science. She grew up in Los Angeles with a Hispanic background. Her parents are from El Salvador. She is bilingual in Spanish and English. Spanish food is not her favorite but she absolutely loves sushi! Ponce went to San Diego State; she majored in Spanish, minored in Chicano studies, and mastered in special education in multiple subjects. Along with everything she learned at San Diego State, the best gift she gained was meeting the love of her life, Jorge Ponce. They’ve been married for 16 years!! They now have two wonderful children together Joel and Sergio. Joel is nine years old and loves boxing. Sergio is five years old and enjoys bull riding. Due to her husband’s recruitment for the Navy, Ponce moved to Roseville a year ago from Los Angeles. She will also only be working here for three years, because of her husband’s recruitment but she will try the best she can to help the students here before she moves again.